FLO Data Manager : FLO makes managing internet on your mobile phone as easy as a pie! It is an incredibly easy-to-use yet powerful app to take control over your data usage and save money on your phone bill. Track your daily, weekly and monthly data usage over mobile and wifi so you know the ‘What’ ‘How’ & ‘Where’ of your data spends! FLO now also helps you track your internet speed. See the top apps consuming your data, both when you are using them and when they take data in the background. So you can identify the most data hungry apps and stop them from eating up your data. Set your daily, weekly or monthly mobile data limit and get notified when you cross the limit. Now you have total control over your mobile spend. FLO is the best data manager application! Data monitoring – Track data usage for every day on your mobile and wifi. Now see your daily, weekly and monthly data usage trends and choose the best data pack for you. The best data monitor widget! App data usage (data track system) – Worried about which app draining your data? 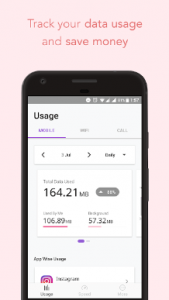 FLO provides the details of exact data usage, letting you know about data consumption of your favorite apps such as Facebook, WhatsApp, Google Allo, Google Duo, Flipkart, Amazon & many more. Now you can see the top apps consuming data in background and restrict them if needed. FLO is the easiest background data restriction app. Data manager and background apps use data. Data monitor on status bar – FLO is the best data monitor app for Android. Now track mobile data from the status bar. Alarms – Set up alarms to avoid data wastage and overuse charges. The smartest save data app. Speed Check – Now test your internet speed with one tap. Troubleshoot or verify the internet speed you were promised. You can also turn on the internet speed meter and view your network speed in your notification bar. Track past speedtest results in History. Easily share your speedtest results with your friends and compare your speeds. FLO works well on networks around the world, including Vodafone, Jio, Airtel, Idea, Tata Indicom, AT&T, Verizon, T-Mobile, Sprint, U.S. Cellular, China Mobile, China Unicom, China Telecom, Vivo, TIM, Claro, Orange, SFR, China Telecom, SK Telecom, NTT docomo, EE, O2, and many more. FLO is a great data meter app that helps you measure and control your data usage. It is the best data manager app for your android phone. Now this is the smartest way to track your mobile data! We would love to hear from you. Give us your feedback through Contact Us option in the app or write to us at flo@u2opiamobile.com. This app is cool. Love the clean interface without any advertisements covering it. Don’t like that it needs access to media files, contacts,usage access and sms to function properly. Also don’t like that it forces to select an avatar. What would be great if it can also measure and control tethering. Good app, but it doesn’t show the data used in mobile hotspot. Please try to improve it. Dear Nayan, data consumed using hotspot is same as data consumed using WiFi. Hence, that differentiation cannot be made. However, if your device’s hotspot is used by another device, that consumption will show up as Tethering/Hotspot under Mobile Data Usage. Please write to us on flo@u2opiamobile.com for further assistance.